In recent weeks accusations of antisemitism directed at Jeremy Corbyn have resurged to a fever pitch. Yet once again, when the substance of the cases is examined, they don't indicate that the Labour Party has a particular problem with antisemitism, either regarding the number of cases or their nature. What the onslaught shows very clearly however, is the way in which this issue is being used to attempt to inflict blows on Corbyn's leadership, as a battering ram by the capitalist establishment and Labour right wing in their drive to see him removed. Among the vehicles for the attacks is not the 'Jewish community' so regularly referred to by the right-wing media, but the current virulently anti-Corbyn leaderships of a few Jewish organisations, including the Jewish Leadership Council, the Board of Deputies and the Jewish Labour Movement. United with them in the aim of slandering Corbyn are Blairite Labour MPs, especially the 70-plus of them in Labour Friends of Israel, which is no more critical of Israel's Netanyahu-led government and its killings in Gaza than is the right-wing led Israeli Labour Party. Corbyn should face "unequivocal condemnation from everyone - left, right and everything in between", declared Netanyahu recently. Among the Blarites who obliged was Labour MP Chuka Umunna, who lambasted Corbyn in a piece for the Independent's website, accusing him of allowing "institutional racism" to "flourish" in Labour. Again, without any evidence that holds water. Corbyn's presence in Tunis in 2014 at a wreath laying ceremony for killed Palestinians was not antisemitic. Nor was a 2011 initiative cited by Umunna to rename Holocaust Memorial Day as Genocide Memorial Day, with the intention of still recognising the appalling horror suffered by Jews in the Holocaust. Umunna also highlighted abusive messages sent on social media to two Jewish right-wing Labour MPs, again without evidence that this illustrated 'institutional antisemitism' in Labour. All abusive, racist and antisemitic messages must be condemned, but there has been no published evidence that a disproportionate number sent to those MPs came from within the labour movement. Also, two separate studies by researchers from Salford university and Amnesty have showed that pro-Corbyn MPs have generally been receiving a much larger number of abusive messages on social media than their critics. Umunna's anti-Corbyn tirade was followed on the Independent's website by a long stream of political comments from the public, most of which strongly disagreed with him, with many suggesting that it's right-wingers like him who should leave Labour rather than Corbynites. While the mainstream media's massive onslaught has unsurprisingly led - according to polls - to more people believing that Labour might have a problem with antisemitism, an Opinium poll reported in the last Observer showed only 16% of people thinking the Labour Party is 'definitely prejudiced against British Jews'. A YouGov poll of Labour Party members in March showed 77% as believing the charges of antisemitism to be deliberately exaggerated. Contrary to the high incidences of antisemitism on the far right, the Labour Party, with over 550,000 members, has at present only got a backlog of 70 cases of alleged antisemitism to investigate. Many of these might prove to be expressions of hostility towards the actions of the Israeli government rather than towards to Jewish people. Some of the others are likely to be angry reactions to the attacks being made on Corbyn, which might be poorly - or well - worded, but not stemming from antisemitism. Recent allegations against Labour MP Chris Williamson, Renfrewshire Labour councillor Jim Sheridan and Labour NEC member Peter Willsman have come into these latter categories. Following Netanyahu's direct attack on Corbyn - which came after the reports of Corbyn's presence at the Tunis commemoration - Corbyn rightly responded by condemning Netanyahu for the deaths of over 160 protesters in Gaza since March this year. 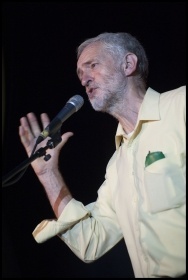 He also pointed out that he was paying respect to Palestinian civilians and Palestinian Liberation Organisation (PLO) staff killed by Israeli bombs on the PLO's headquarters in 1985, and in the words of his spokesman: "Jeremy did not lay any wreath at the graves of those alleged to have been linked to the Black September organisation or the 1972 Munich killings. He of course condemns that terrible attack, as he does the 1985 bombing." That condemnation of terrorist acts against civilians was important to make clear. 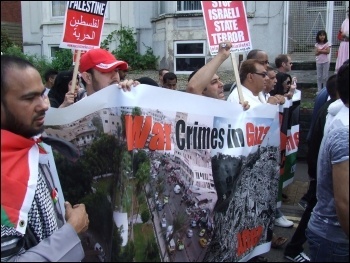 They not only result in terrible loss of life of ordinary people but also have never aided the Palestinians' struggle. Such atrocities are followed by a subsequent strengthening of reaction and repression against the Palestinians and don't help to build the mass struggle that the Palestinians need to engage in. While the hypocrisy and lies in the attacks made on Corbyn on this issue must be exposed - including the false accusation of antisemitism, it's also necessary for the Labour left to adopt a clear class-based position on the struggles in Israel-Palestine. This means siding with working class Palestinians and Jews and their interests and supporting their struggles and genuine representatives. Some left organisations and individuals internationally have mistakenly given support to Fatah - the leading PLO party - in its period of resorting to terrorist actions or in the decades afterwards, or to the right-wing Islamist Hamas party. These parties, however, have never had programmes that can advance the Palestinians' cause, and today are pro-capitalist and with leaders who in reality fear the development of a mass, democratically organised struggle against the occupation. Three newspapers, the Jewish Chronicle, Jewish News and Jewish Telegraph, carried identical frontpage onslaughts on Corbyn, demanding that he accept all the 'examples' associated with the International Holocaust Remembrance Alliance (IHRA) definition of antisemitism. However, these examples were not originally aimed at setting boundaries of behaviour, as one of their originators, US lawyer Kenneth Stern, has pointed out. He advised the US House of Representatives not to adopt them in US colleges, arguing that the definition's clauses could be used to suppress freedom of speech. One of the examples he gave was of a speech due to be given by a Jewish survivor of the Budapest ghetto at Manchester university in March 2017. It had the subtitle, aimed against Netanyahu's Israeli government: "You're doing to the Palestinians what the Nazis did to me." Israel's ambassador to the UK complained that it breached the IHRA definition, with the result that the university placed restrictions on the meeting. Many other lawyers and academics have criticised the IHRA definition and its examples as being unsuitable for practical use. Even the cross-party Westminster home affairs committee in 2016 judged the definition to be inadequate in protecting the right to criticise the Israeli government. Umunna was one of the members of that committee when it drew that conclusion, but now dismisses it. In addition, it has shortcomings for Jewish people. Yair Wallach, head of the Centre for Jewish Studies at SOAS, London university, wrote: "Insisting on a particularistic, Israel-centred definition has resulted in a poor text which provides Jews with far weaker protection than existing UK Equality legislation" (Israeli website Haaretz, 26.7.18). But the main issue at present isn't a rational debate over the merits of the definition, but the way it has been seized on as tool for a witch hunt of parts of Labour's left, in particular Corbyn. The attacks have been whipped up to such a frenzy that people are called antisemites just for questioning the scale of the problem or the motives of those making the attacks. Even the Zionist Kenneth Stern could be labelled as antisemitic according to the benchmarks being used by those leading the attacks. The Israeli government has long flung out accusations of antisemitism against anyone around the globe opposing its policies. Now, the coordinated frontpage editorials by the above three British Jewish newspapers directly imply that criticism of the Israeli government should be classed as "political antisemitism" - ie that such criticism should be banned in Britain. Shamefully, the trade union leaders Dave Prentis of Unison, Tim Roache of the GMB and Paddy Lillis of the Usdaw jumped on the bandwagon of insinuations against Corbyn from those organisations and other sources, by repeating some of their allegations and calling on Corbyn to accept the entire IHRA definition. These right-wing union leaders argue that adopting the full definition is a necessary step towards creating unity in Labour and retaining support from the 'Jewish community'. Unite general secretary Len McCluskey, on the other hand, has intervened from a welcome pro-Corbyn standpoint, arguing that Labour isn't an antisemitic party and pointing to the plotting that has been taking place by Blairite MPs towards forming a breakaway party. He has rightly recognised that: "the more Corbyn has personally sought to build bridges [towards those attacking him], the worse the rhetoric [against him] has become". So his hope, expressed in the same article, that another attempt to conciliate with the right by accepting the IHRA definition in full could enable the party to 'move on', will not be realised. The approach of Corbyn himself, while refuting some of the lies being told, is mainly placatory, conceding regularly to demands by the right. It's now clearer than ever that this approach won't work - the pressure from the right will go relentlessly on, and the only response which will take the labour movement forwards is a very bold counter-offensive. This means exposing the motives of the right wing and vigorously pursuing democratisation of the Labour Party and an agenda of reselections of parliamentary candidates to kick out the pro-capitalist Blairites. Of course there should always be action taken in the labour movement against real cases of antisemitism. But the movement has to democratically decide its own codes of conduct independently of pro-capitalist organisations and views and not be pushed into making concessions to opposing class interests. Unfortunately Jeremy Corbyn has few left leaders around him who advocate a strong, firm, independent approach. The Momentum leaders cave into pressure from outside the labour movement and take a defensive, concession-based path. One of the latest examples is their withdrawal of support for the re-election of Corbyn-supporting Peter Willsman to Labour's NEC after he made comments against the right's antisemitism attacks, which were distorted by the capitalist media as being antisemitic. But Corbyn can and must turn to the support of the hundreds of thousands of Labour members and the millions beyond them who are desperate for change, in a battle to transform his party. No false unity with the right will achieve this. If a number of them break away in order to try to split the Labour vote and reduce the chance of a Corbyn-led government - and to preempt themselves being deselected as Labour candidates - it would remove them from being in a position to directly obstruct moves to the left in Labour. Such left moves are crucial to Labour being able to offer an attractive programme of countering capitalist interests and delivering socialist change. It is only concrete steps in that direction which can definitely bring about and secure the position of the next Labour government, not more concessions and leeway for the wrecking policies of the right. Click here for an article - New protest against the Nationality Law - by Yasha Marmer, Socialist Struggle Movement in Israel-Palestine, on the demo of tens of thousands of Jews and Arabs in Tel Aviv on 11 August. 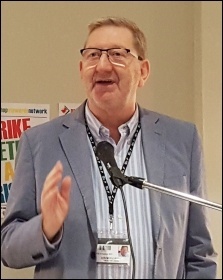 This version of this article was first posted on the Socialist Party website on 21 August 2018 and may vary slightly from the version subsequently printed in The Socialist.